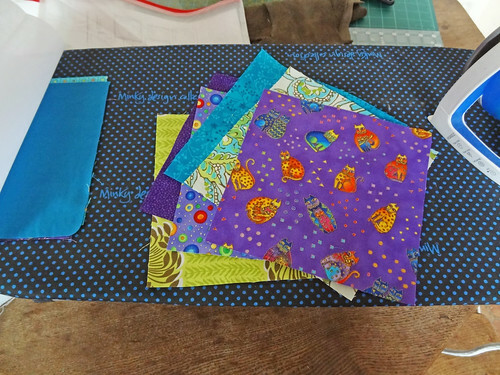 Stitched Together: I've Been Sewing! I know it's a small miracle, but I have been sewing. I'm really excited about this as normally when my pain increases I have to lay off the sewing, but recently I have been working on ways of managing to continue to sew, despite my increased pain levels. The main method of managing my sewing is to actually do what I'm supposed to do - PACE!!! This is the first thing you learn when you are starting to deal with a chronic condition. You learn that you need to break tasks down into manageable chunks, to do little and often rather than do things in one big push. You learn to stop before you start to hurt more than usual and to carry on doing a little bit even when you feel rubbish. It's meant to help you even out your highs and lows and stop you doing serious damage to yourself. I always found it really hard to pace with sewing. I would get stuck into what I was doing and get distracted, and the next thing I knew I was lying on the sofa in agony. So rather than carry on sewing last time I was really bad, I stopped so I didn't damage myself. I have decided that this time, I will not stop sewing, I will just be more strict with myself. I will only work on my sewing projects for 20-30 minutes a day and no more. And so far it is working! I'm really proud of myself for sticking to my guidelines. 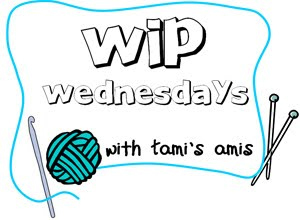 It means that I am moving slowly on with a project I really want to finish. I don't think it will be finished by the deadline set by an impending birth, but I think the recipient will forgive the lateness of the gift. The project is a cot quilt. It has elephants on it! I fell in love with it when I first saw the pattern on Sew Much Ado. I am hoping that this will be my first finished quilt. 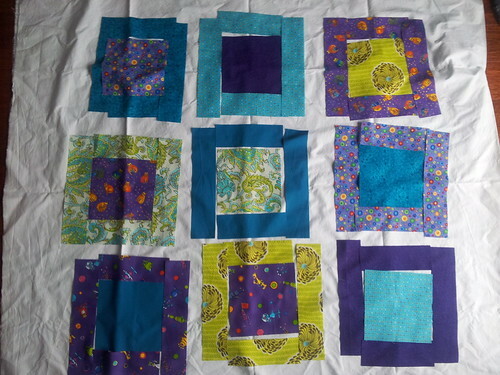 I have started two other quilts, but they are still awaiting their sashing and their putting together and quilting. This is because they are both fairly large sized quilts and I have been put off by their size. This cot quilt is meant to be a finished size of 45" x 45". I think I can manage that. I have cut all the block fabric out and have decided on a layout. I apologise for the poor photo but I used my mobile phone camera and it was an overcast day. The photo was meant only as an aide-memoir so I would know how to construct my quilt top. You can see some of the fabrics a little more clearly in the following photo. By the way, that little table top ironing board is one of the ways in which I have aided my pacing. It is incredibly light and when it is put on the table, where I do my sewing, it is the perfect height for me to do my pressing. It means I can put the board up without having to ask my partner to do it when he comes home from work. I can use it whenever I want. As it is not free standing it does not take up any extra space, so it can be left up if I know I'll be using it again the next day. With this quilt I have been working slowly, day by day, sometimes having to rest for a while before starting again. 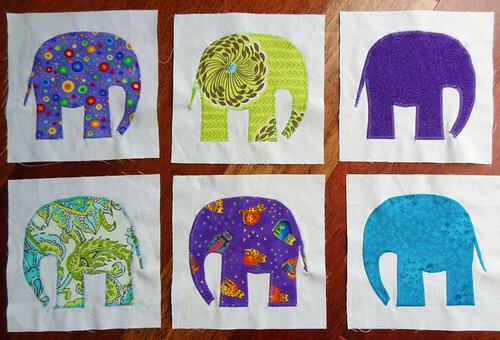 First I cut each fabric out and now I am working on the elephant applique. I have done 6 of the 9 blocks! I am being held up after ordering more heat n' bond, but I will probably start attaching the border to each of the finished blocks while I wait. I am so proud of what I have accomplished with this quilt, by breaking it into little bite sized chunks. I know it won't be finished in time, but I'm sure the baby won't mind getting it for Christmas! The pattern recommends sewing the applique pieces 1/8th" inside the outer edge. 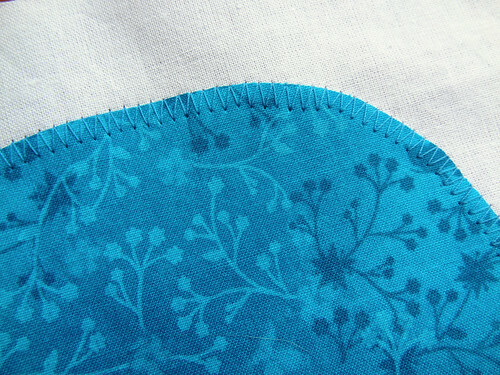 I decided that I didn't want the ragged edge look and decided to try out the zig-zag stitch on my sewing machine. It was so nice to use something other than a simple straight stitch. This machine was supposed to grow with my abilities, but I haven't really tested it much of late! I'm quite proud of how well I managed to control the machine, even if a few of the zigs went a little awry, essentially the edges are all encased within the stitching. So tomorrow, if my heat n' bond doesn't arrive, I will stitch on the border to one of my blocks. It is always difficult to stop after each little session, but I want to keep on sewing and I can only do that if I stick to my own rules and only do a little each day. If I can't stick to those rules, sewing will be banned again, and that would break my heart. I really think quilting is the way forward in this new future of paced sewing. It naturally breaks itself up into small sections. I hope that my first machine quilting endeavour will lead to me finishing up those original quilts that never got to completion! At least this quilt will be small enough for me to wrestle around the machine (I hope). For other, less slow, works in progress, click on the button!